Error communicating with the server. Please check your internet connection and try again. From her tablet, I can check email and browse the web and the Amazon store. 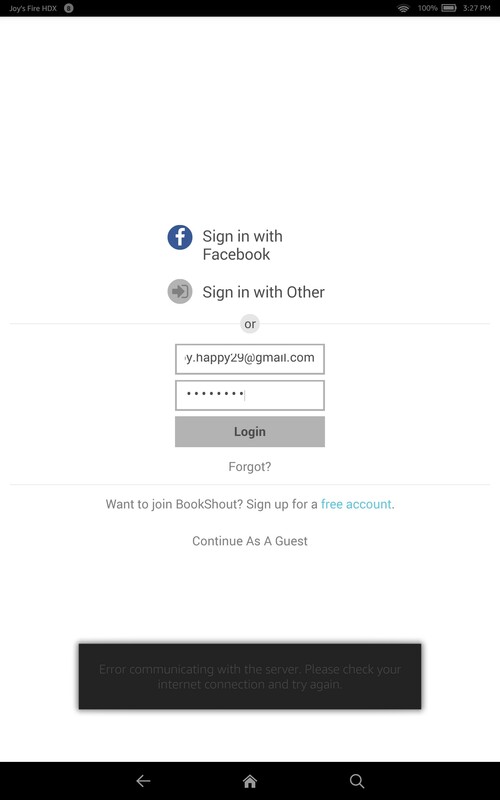 I even downloaded and installed the bookshout! app again from the browser, but get the same error. Thus, the error message is bogus; the problem is at the server end. What is the email address associated with your wife's account? Can you please restart the tablet and them access the app again? Do you still receive the same error? If you do please take a screenshot and send it to us. Also please tell me the version of app you are running. Tiffany closed this discussion on 14 Sep, 2017 01:52 PM. Joy's email address is [email blocked]. little book icons continuing to draw. 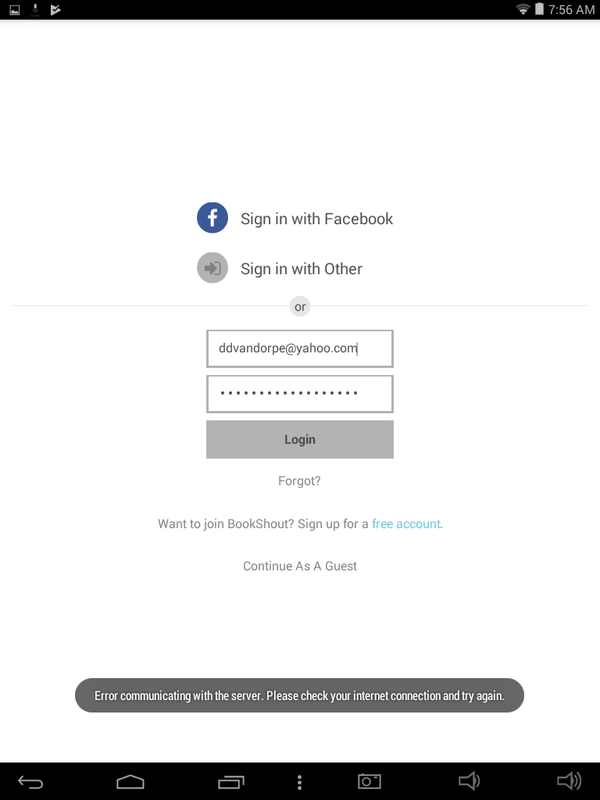 The version of the BookShout! app is 10.5.
for the app, but that didn't resolve the problem. is just your app that is having difficulty. We have been testing on a Kindle Fire HD8 and are not seeing the issue you mention. Can you please send us a screenshot of the error and send it to us? Tiffany closed this discussion on 15 Sep, 2017 05:44 PM. Joy's tablet is a Kindle Fire HDX 8.9" (3rd Generation). worked fine, so as I mentioned, networking is fine on the device. It has 17.43GB free storage. I sm having this same problem on a NuVision android tablet. I have tried all the same things: log out and back in, clear cache and data, uninstall and re-install latest version from Google play store, reboot. Still get the "Error communicating with server... " error message. I have attached a screen shot. I'm posting this using the same device, and the same WiFi connection, so I know my connection is good. Thank you for sending us the extra information regarding the tech specs of the Kindle tablet. We have been able to recreate the issue you are seeing. The issue lies in the version of OS on your devices. Our development team is working to address the issue. Thank you for your patience . Tiffany closed this discussion on 18 Sep, 2017 04:31 PM.